I have been dodging the “cold” bullet for weeks now, with symptoms surfacing and then disappearing before they ever really amount too much. However, this afternoon, I could feel that impending blanket of congestion settling in as the afternoon progressed. I am one of those people who can go from feeling healthy and fine to full-blown cold within 20 minutes. So, as I sit here forcing myself to get something posted for tomorrow, I have tissue shoved-up my nostrils to prevent my nose from dripping on my laptop. Ugh!! Made her famous “Mustard Plaster” ~ a homemade mustard paste that was spread on a paper bag and then set on your chest. This always helped, but you had to be careful because it could cause blistering if not watched closely. 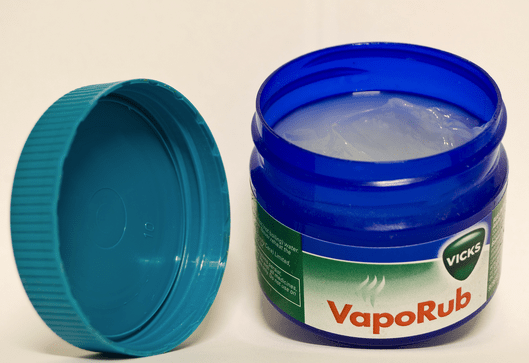 I am not saying these remedies didn’t work, but recently, a friend shared that her mom always applied the Vicks to the soles of their feet and then had them put socks on over the Vicks before bed. She said it worked like a charm. Of course, when she told me this I was in the midst of fighting off a nasty cold. I went home that night and tried it and could not believe how effective it was. Since then, we use this simple remedy all the time. Most often, we don’t have to take any night-time cold medication as this seems to relieve all of the symptoms without the need of drugs. I am already dreaming of a cozy sleep with my trusty Vicks remedy. I decided to do a bit of research to see if I could find out any info about this cold remedy and I found this post on about.com. Check it out if you are interested in reading more about it. I love that this can effectively help to relieve congestion and help you to have a good night sleep without loading up with cold medicine. My husband finished dismantling most of the piano a few weeks ago and it was at this point that we decided to move it to our kitchen. Initially I had no idea what I was going to do with our old piano, but eventually I formulated what seemed like a grand plan. I thought it would be very cool to replace the table in our kitchen with the piano and use it like a “bar” type table. I had ideas for how I might incorporate some built-in cubbies and was deciding on a colour scheme. My only concern was the actual size of our kitchen and how this piece might impact the general flow of the kitchen. Although we already had a table there, it was considerably smaller and I didn’t want to go to a bunch of work and then hate it. When we initially moved it in, I was immediately disappointed as it seemed to over power our long narrow space. We decided to leave it be and live with it for a while before making any final decisions. After about a week or so, I was getting used to it and I felt myself once again getting excited about the idea of finishing this unique piece for our kitchen. I am still in a mid winter “February Funk” and hardly have enough energy to do the menial tasks like cleaning my house, let alone refinishing a piano. So, fortunately I haven’t done a thing with it yet….why is this fortunate you might ask? Well, evidently it takes more than a week to really get a feel for something. Lately, I find myself walking through my kitchen and feeling an almost uncontrollable urge to kick the stool that seems to constantly be jutting out into the “path” because someone hasn’t pushed it under the piano properly. It seems as though someone or something is always in the way. Yikes! This piano is absolutely not staying in my kitchen, but now I need to get back to the drawing board to figure out what I am going to do with it and where it is going to go. You can see that the iron harp is still inside the piano. It is what makes the piano so crazy heavy. I still want to remove the harp, but we haven’t had a chance and thought we would leave it until we made a final decision on what to do with it. I actually love the iron and hope to somehow use it as well. I must say, having the piano “under foot” everyday has been good for something. First and foremost, my mind is constantly thinking of how I could use it and where I might put it. I don’t have all of the answers yet, but my creative juices are definitely flowing and that’s a start. I really do love the structure and it will be a fabulous addition to our home, I’m just not sure how yet. Secondly, the piano helped me to realize how much I didn’t like the table that sat in the kitchen prior to the piano. It was actually too small. I now know what I want. We need a table that is longer than the old table and perhaps even slightly longer than the piano, but the depth needs to be more consistent to that of the old table for functionality. I am already busy thinking about how I might build a custom table and/or counter to fit in the space. Here we go again….it seems like there is always a new idea and therefore a new project! When planning any kind of theme party, I love to try to make a really cool invitation. Eden has had two different sleepover parties that really didn’t have a more specific theme. I thought I would share two completely different ideas for how to make a fun and unique party invitation. For this invitation, I made a postcard style card. 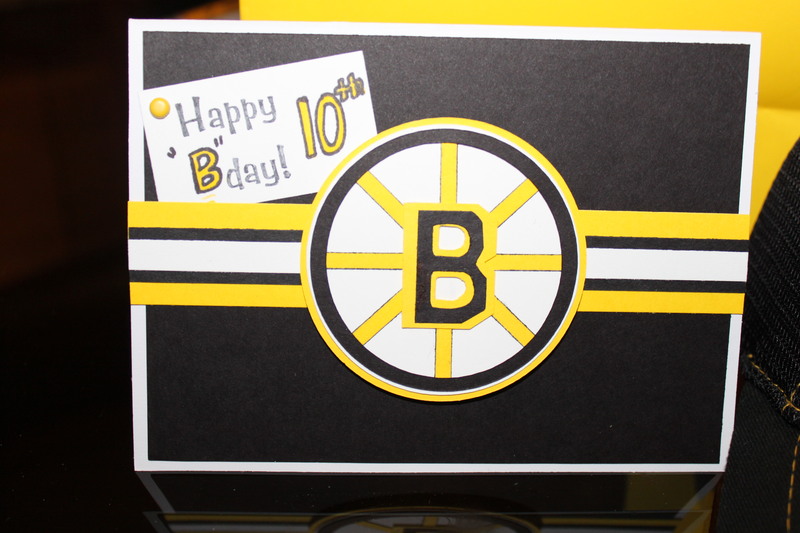 When making this style of a card, I create a full-page document and then duplicate the page four times. When I go to print the invitation I select “print 4 pages per page” so that all four postcards will print on a quarter of a sheet of card stock. To see a full tutorial on how to do this, check-out my Snowflake Birthday Invitation. The computer portion of the invitation just contained the standard information: date, time, location, what to wear, what to bring, etc. On the back of the postcard, I began by adding a layer of black that was slightly smaller than the white card stock and then followed that by a slightly smaller piece of patterned paper. Because this party theme was really just a “sleepover”, I chose to stick to a specific colour scheme for the party. I decided on pink and orange. Once the printed invitation and base were created, the invitation really began to come together with the embellishments. For this invitation, I googled clip art of both pillows and slippers. From those ideas, I actually drew my own version of both. For the slippers, I made one, then scanned the image and copied it to get multiple copies of the slippers on one page. I printed the image on orange card stock and then used markers to colour it in and add the details. The pillow was a very simple drawing, so I made a tracer and simply traced and cut out enough for each invitation. I inked the edges of the pillow and drew a little “slit” at the end of the pillow case. For the font on the pillow, I used a combination of stamps and Cricut cut-out letters. The P, J and R were made on my Cricut, but the other letters were stamped on the pillow. I adhered the slippers to the bottom corner of the invitation, so that they overlapped the pillow slightly. The final step was to attach the pillow/slippers to the base. I wanted to create a three-dimensional effect, so I only attached the pillow at the ends, so that I could easily slide stretched out cotton balls beneath the pillow to add dimension. I actually found that I didn’t even need to glue or tape the cotton, as the pressure from the pillow seemed to hold it in place. The photo really doesn’t show the 3D aspect of the invitation, but the pillow does have some dimension in real life. The P in the top corner is actually part of my scrapbook layout from the party, not party of the invitation. I always make an extra invitation that is added to their birthday scrapbook layout. For her second (9th) sleepover party invitation, I wanted to do something completely different. This invitation consisted of many components and was a bit complex and time-consuming to make, but the finished project was pretty cool. The back of the invitation contained a timeline of the events we had planned and a checklist of what they should bring. Here is the pdf for the Sleepover Party Brochure. On the opposite side, I used various printed papers to build a sleeping bag and pillow. The slipping bag was basically made with a layer of polka dot paper and a scalloped edge border for the top of the “bag”. I ran my sewing machine all the way around the outside edge of the invitation using white thread and a large zig zag stitch to hold the paper layers in place. This left both the top and bottom of the sleeping bag open. I used white cotton fabric scraps to sew and stuff an actual pillow for each invitation. I basically made a rectangle by placing right sides of the fabric together and sewing all the way around. I cut a small slit in the middle of the back of the pillow and turned the little pillow right side out. I then ran my machine down both ends and made a zig zag top-stitch down each side. I used the slit in the back for stuffing the pillow with cotton batting as well. I didn’t even close the slit as I would be gluing the pillow onto the invitation and it wouldn’t be seen. I made the actual invitation portion of the card on the computer (date, time, location, etc.). I printed it on white card stock and then mounted it on orange. I added a short tab made from ribbon and secured with an orange brad. This slid under the “foot” end of the sleeping bag, with the tab sticking out so it could be seen and pulled out. Finally, I made paper dolls for each of the girls. I honestly can’t exactly remember how I did this, but I think I found one (or maybe a few different ones on-line??) 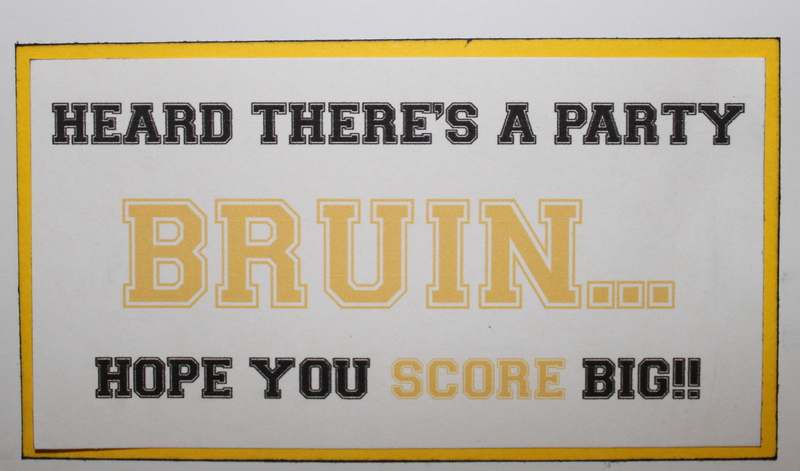 and printed them onto card stock. I then used watercolour pencil crayons to colour their skin, hair and features. 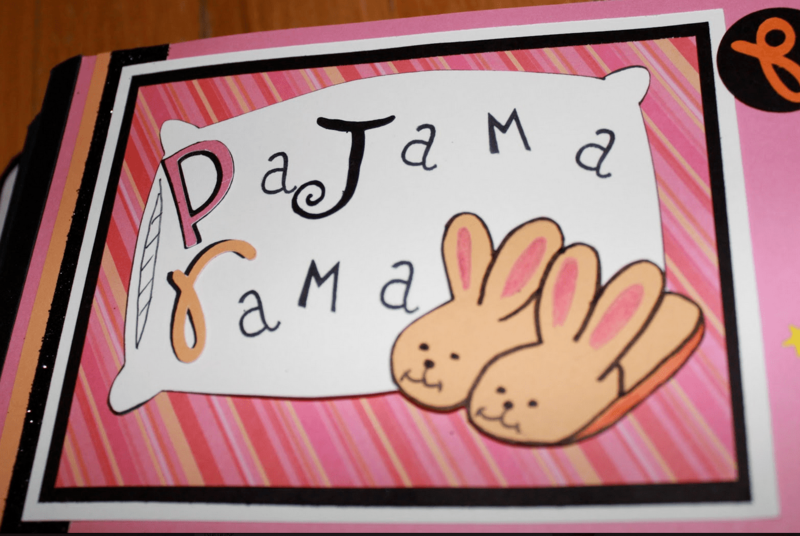 Finally, I made each one a “nighty” out of patterned paper. I stamped a little white fringe at the bottom of the nighty and added a few button brads on the front. The nighties were secured in traditional paper doll style by folding the tabs over the back of the dolls. The paper dolls slid inside the top of the sleeping bag. The brochure indicated they should bring their dolls to the party. One of the activities the girls did at the party was design and make clothes for their dolls. I had some templates, writing/colouring tools, scissors, patterned paper and other embellishments for them to use. taped a Starbucks stopper/stir stick to coffee gift card. I loved this idea because it not only looks good, but smells delicious too. What homemade gift is complete without a homemade card to go with it. I saw this idea on Pinterest and thought the idea would work perfectly for this coffee themed gift basket I was making for my children’s teacher. I downloaded to free fonts for the greeting: KG Skinny Latte and SF Espresso Shack. This card was super easy to make and I kept it very simple because I wanted it to look like a coffee cup. I made it postcard style, so the greeting is on the back. I cut out embossed white paper that I had on hand in a mostly rectangular shape, with the slightest angle extending from the top of the cup/card to the bottom so that there was a bit of tapering towards the bottom. I then used brown ink to darken the edges. I used a woven textured white paper for the lid of the cup. I basically cut out a long rectangle to fit on the top and extend slightly over the sides. I then carefully cut the sides of the top to create a lid like look. I inked the edges of the lid as well. The card is quite plain, so the ink just helped to give it a bit dimension. I took a piece of brown card stock and ran it through my crimping tool. I made it long enough that I could wrap it around the cup and slide it under the “greeting” on the back of the card. I cut-out a circle charm on my Cricut (has slits in it) and slid some brown ribbon that I had on hand through the slits. This ribbon actually had an adhesive backing, so it was as simple as peeling and sticking it to the corrugated card stock. I then used some Weld Bond glue (my favourite crafting glue) to stick the little button heart on the top corner. For the greeting, I wanted something to fit with the coffee theme. I am a total sucker for word plays, so I wrote a cheesy little “coffee greeting”. I downloaded two free fonts for the greeting: KG Skinny Latte and SF Espresso Shack. 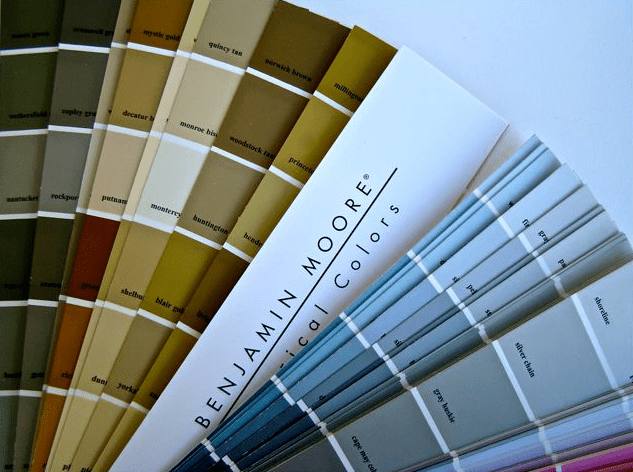 Paint chip projects are all over the web and like so many others, I absolutely love the cool things that are being made with them. I have wanted to do something with paint chips for a long time, but have never really gotten around to committing to anything quite yet. I guess a part of me is a little uncomfortable with going and taking an entire stash of paint chips. I know they are free for the taking, but it still makes me feel uncomfortable. For this project I did select a few panels as I was on a very specific mission. I don’t know my children’s teacher very well, but I do know she likes coffee. 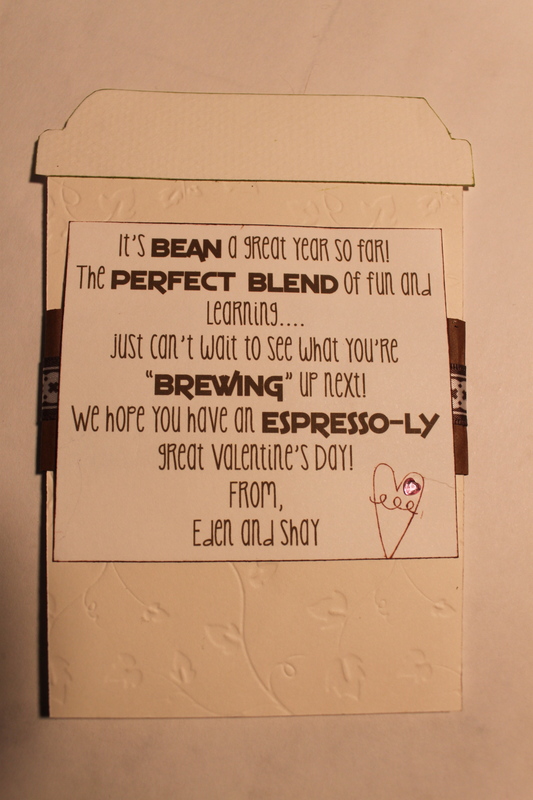 For Valentine’s Day, I wanted to make her a little coffee themed goody bag. I thought that a coffee themed bookmark would be a cool idea and then I could finally say I have done a paint chip project. I went to the paint store and found a small selection of colours that actually have “coffee terminology” in their title. I was able to find the following: light mocha, cappuccino, café mocha, and espresso. Of course, they weren’t on the same panel, so I had to cut three of the squares out and cover the existing squares on the “espresso” panel. 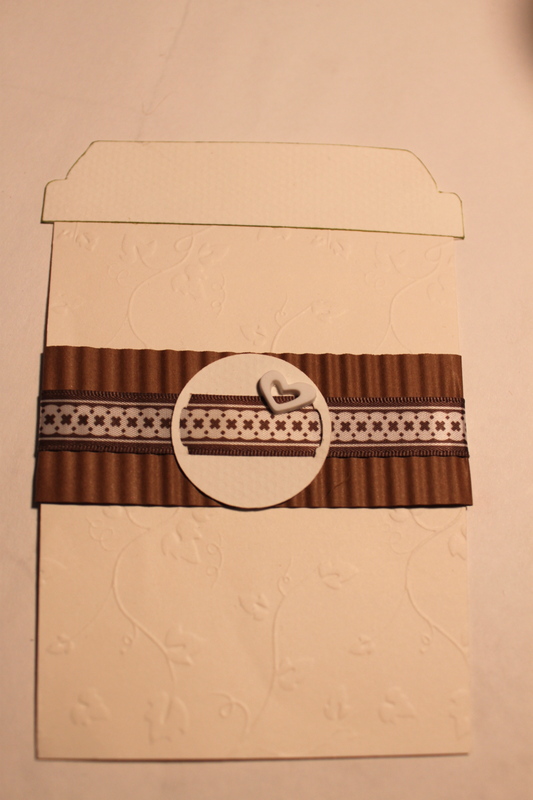 I then double mounted the paint chip card on white card stock, followed by brown on the base. I found some coffee clip art online and just printed the little coffee logo off on my computer and then cut it out with my circle cutter. For the reverse side, I found this cute little poem type verse on-line called Coffeeology. * I basically just retyped the words on my computer using various fonts to create the final look. When typing, I created a text box that worked with the long and narrow dimensions of the bookmark. Finally, I punched a hole in the top and added an eyelet to prevent the paper from tearing. I added a ribbon and a little wire with beads at the end (both were salvaged from the Christmas Crackers handed out at Christmas dinner). I also added a little button to the Coffeeology side of the bookmark. *Coffeeology is all over the web and therefore I don’t know who the original source or author is. I tried to research it, but came up empty. There is a coffee shop called Coffeeology in North Carolina, but I can’t seem to connect the two. So just to be very clear, I did not write this, but would love to give credit to the author, so if you know something I don’t, please let me know and I will update this post.